Hey All! Melissa here with my first-ever blog post for Just Jaimee. I was asked to share my Top 5 Digital Scrapbooking Tips in regards to my style and that got me thinking… Do I really HAVE a style? I create artsy layouts, Project Life layouts, minimalist layouts, clustered layouts – I love them all! One thing that ALL of my layouts have in common, though is this: I am always looking for ways to complete my layouts without spending HOURS and HOURS on them. In fact, under 30 minutes is ideal. Don’t get me wrong – there are many scrappers out there who DO spend hours on their layouts and end up with breathtakingly gorgeous layouts with perfect shadows and unbelievable clusters. And there are days that I wish I had time to do that too, but with 4 littles running around my house and a hubby that works insane hours, time just isn’t a luxury I have to throw around like that. With that said, I still manage to stay up-to-date with my scrapping and today I’m going to share with you HOW I do that! 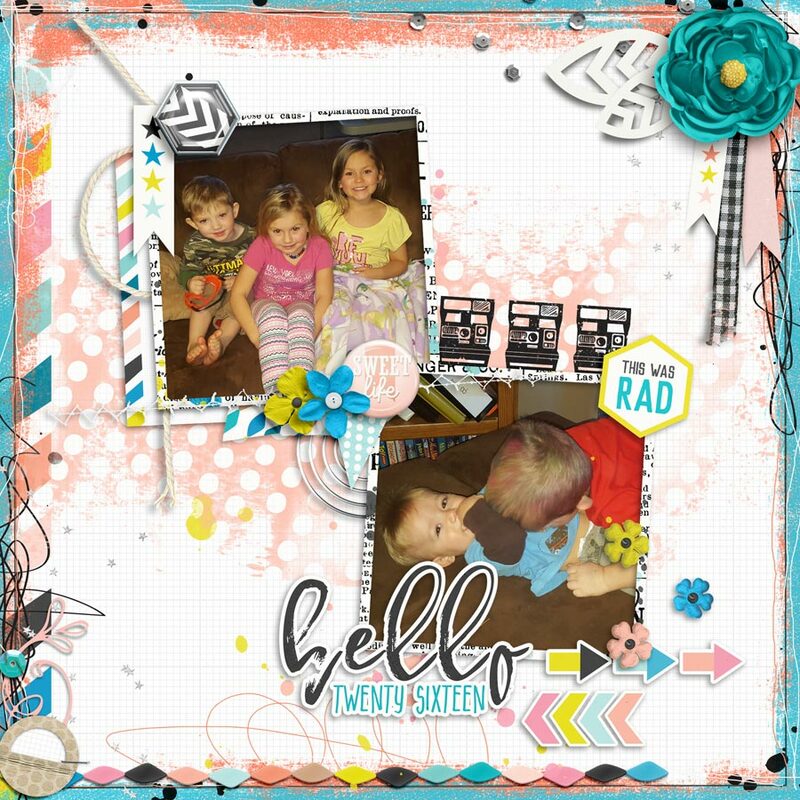 – Stacked FramesMy favorite products for quick layouts are Jaimee’s quick page options. There are flattened quick pages that you can simply add your photo(s) to (and a little journaling, if you want) and you’re done. Easy peasy. Otherwise, Jaimee also offers LAYERED quick pages (called Ready-To-Go pages – she’s one of the only designers in digi land to do this!). You can use these as-is OR you have the power to change it up a bit and move papers/embellishments around on the page. Most of the work is done for you; you can just tweak a bit to make it perfect for your photo(s). Here’s another layout using Jaimee’s Storyteller January 2016 borders & stacked frames. This layout is seriously 5 layers. One layer for the background, 2 for the photos, one layer for the stacked frame, and one layer for the border. Crazy, right?! And again, it was completed in under 5 minutes. I know that with hundreds of kits on your hard drive, it’s tempting to sift through all of your kits to find the PERFECT button or flower to use on your layout. I am begging you, RESIST THE URGE. There are few better ways to waste scrapping time than digging through countless folders on a quest to find the perfect embellishment – especially when the ones you have in the kit you’ve already selected are just fine. 🙂 Even if you’ve tagged all your digi scrapping supplies and can search for “buttons” with just a few keystrokes, you’ll probably still have hundreds of “buttons” to search through and that takes time! If you’re scrapping with a Just Jaimee kit, you’re in luck: Jaimee’s kits are massive and include everything you’d want to create a gorgeous layout. Seriously – you won’t need to look any further. If you absolutely insist on using a staple and you don’t have one in the kit you’re working with, okay – go find one. But be smart about it: use your computer’s searching capabilities to search for a staple for you (or use your tags if you’ve tagged your supplies). There are always multiple ways to accomplish a task. That is as true in digital scrapbooking as it is in the rest of life. Sure, you can use your mouse and hunt through the drop down menus to find the tool you’re looking for each time you need something and you’ll eventually get your layout done, but learning your keyboard shortcuts will save you tons of time. Keyboard shortcuts will be different depending on what software you use to scrap, but here are a few of my favorites for PSE. – Shift + Alt + Backspace: Fills selected layer with the foreground colorIf any of those shortcuts are new for you, write them down on a post-it note and stick it on your computer until it becomes second-nature. Trust me – you’ll thank me later when you’re breezing through your pages! Who out there would love a whole weekend away with friends at a scrap retreat to create tons of layouts without interruption? *hands all raise* Now, who out there actually has the time or the means to get away for a whole weekend? *silence* It’s a great idea in theory, and sometimes we get lucky enough to sneak away for a day or an overnight or *gasp* even two – but let’s face it: most of the time, scrapping time is hard to come by. At my house, scrapping time usually happens in the early morning after my older two get on the bus while I snuggle with my younger two and watch Paw Patrol on Nick Jr. Sometimes I scrap while my baby nurses. Or I scrap for a few minutes after I’ve put the last child to bed before my hubby comes home from work and wants to hang out. Rarely do I have more than 30 consecutive minutes to sit down and focus before someone needs something. My tip for you for battling the frustration that comes along with never having “any time” to scrap: Accept it. Acknowledge that you aren’t going to have hours uninterrupted and work with what you do have. Have 10 minutes before the kids get off the school bus? Perfect. Scrap. Dinner’s going to take 20 more minutes in the oven? Great! Get a page going. Kids in the bathtub are actually getting along and don’t need you for a few minutes? Go wrap up that page that you’ve been putting off. Scrap when you can, where you can. I can’t tell you how many layout’s I’ve completed 10 minutes at a time.When you’re scrapping a few minutes at a time, keep your layout open in your scrapping software and leave your computer on. If you have to reboot your computer and start up PSE (or whatever you use) every time you have a few minutes to sit down to work, you’re going to take up a lot of time waiting for your computer to start up. Just be sure to save your progress before you walk away from your computer when you’re done! Also, get creative about WHERE you scrap! If you have a laptop, this is super easy! Take it along on an airplane or in the car while you drive to Grandma’s house (not while YOU are driving though, please!). Here’s a layout I created in my van on the way home from a football game using Jaimee’s Storyteller October 2014 kit. If I had waited until I got home to scrap, it would’ve taken DAYS because I got busy catching up on laundry, grocery shopping, and unpacking from being gone. 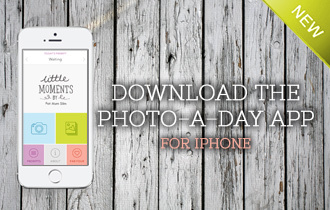 If you’re into Project Life scrapping (and have an iPhone), check out the Project Life app from Becky Higgins. I am an Android user, so I haven’t had a chance to play with it, but I have friends who SWEAR by the Project Life app for their everyday scrapping and get their photos scrapped on the SAME DAY the photos were taken. How’s THAT for recording your memories while they’re still fresh?? And to help keep your Project Life layouts looking awesome, Jaimee has packs of Project Life cards and even offers her stacked cards in a trimmed format that is Project Life app friendly. Want to know more about how to do this? Check out Jaimee’s tutorial here. Inspiration is everywhere and there are many digi scrapping communities and galleries out there (and Pinterest!) where you can find inspiration to help you complete your layouts quicker. There’s no need to be stuck with low mojo – find a layout you love something about and just it to push yourself forward. Check out Just Jaimee’s CT Board on Pinterest or her gallery at The Lilypad.One of my favorite tips to check out the CT layouts in a shop when I purchase a kit. Any CT layouts that I love, I save to my hard drive and add in with the kit once I have it downloaded. Then when I open up the folder to start scrapping with that kit, I can see samples of how other awesome scrappers have used the different pieces of the kit – sometimes in ways that I wouldn’t have thought of! From there, I can scraplift one of the CT layouts completely, or just take pieces that I like and incorporate it into a design of my own. Give it a try next time you purchase a kit, or go back to a kit that you purchased recently and check out the CT layouts posted with the kit.In case you don’t have time to go browse on your own, here are a few of my favorite layouts from Jaimee’s Pinterest board and shop gallery that I am hoping to take inspiration from in the very near future! Layout by Jenevang at The Lilypad using Just Jaimee’s Storyteller February 2016 kitI love all the white space in this layout and the way she mixed the sticker flowers with the more realistic flowers. I also really like the idea of having the journaling space peeking up from the paper along the bottom. Layout by lulyg14 at The Lilypad using Rad Lad by Just Jaimee & MommyishI love love love the cutouts here and the color palette – I have used this kit multiple times, but this layout makes me want to pull it out to play with again! Looking through the gallery, I was definitely gravitating toward the layouts that had cutouts on their background papers – maybe that’s a hint that I should use that inspiration on my next layout! Layout by desirae_nicole at The Lilypad using Just Jaimee’s Storyteller January 2016 I love EVERYTHING about this layout! I will be scraplifting this one for sure. I love how the two halves show different sides of her personality/daily life and how perfectly the kit elements worked with the layout. Now that you’re geared up to get scrapping, here’s a homework assignment: Find an inspiration layout that you love in Jaimee’s gallery or on her Pinterest board (I linked you up to both above) and scrap a layout using it as your inspiration. Be sure to use a Just Jaimee kit and then post it in The Lilypad gallery and tag it #JaimeeFebBlog so we can all admire your work! 50% off Ready-To-Go Pocket Page Templates today only! Ideas on how to use Vellum + NEW February BYOC! This was an excellent article – hard to believe its your first one :). Thank you for your tips – you gave me a few I hadn’t thought of and I’ve been digital for almost 10years! Thank you! I hope you get a chance to try out a couple of the tips that were new to you – I’d love to hear how it works out for you! Excellent article! I routinely do #2 and #5 – and it must be working for me, as I managed 51 layouts so far this year, and 636 layouts in 2015!!! Wowzers!! 636 layouts in one year is IMPRESSIVE! I can’t imagine even taking enough pictures to do that many layouts! 🙂 I really believe #2 is SO important when it comes to scrapping quickly. Great article! I just subscribed to Just Jaimee’s Storyteller Collection. I know there is a ton of awesomeness in the monthly collections I have yet to discover, so it is great to read these “inside” tips to help me make the most of my subscription! Congratulations!! You will be so happy you decided to subscribe! 🙂 The Storyteller Collection is always awesome, and there are so many goodies in those kits to make MULTIPLE layouts with – which means LOTS of Creative Team inspiration for you to check out to help you find different ways to use all the elements/stacked helpers. Be sure to check out her gallery at The Lilypad for loads of inspiration, and she has a special Facebook group just for Storyteller subscribers, too, where lots of gorgeousness gets posted. Hi, there! You have a wonderful writing style! You are very engaging! All great tips, too! I do most of these. I’ve been in this for about 10 years, myself. My time is more my own, as I am retired, so, I don’t really have to ‘grab’ moments to scrap. However, I WAS doing all the stuff I needed to do first, household stuff, errands, phone calls, time with grand children, etc, to get it out of the way, so I could go play in Photoshop without having to go do something else. (Does one ever really retire? Completely?!) Ha! By the time I opened PS, I’d have gotten so sleepy and tired, I couldn’t do a thing! I’ve reevaluated all this, lol, and now, my Photoshop time is first, then, I take care of what I have to do. I actually learned to do this from Sebastian from “Photoshop Artistry”. I tend to lean more towards art than scrapping, but, combine the two a LOT! I also wanted to add that the shortcuts are unbelievably time saving! My mouse arm is very grateful for them! LOL I just try to learn a couple a month. Oh, and I do believe most of the shortcuts you give are the same in PS, other than the modifier keys, i.e. – Cmd/Ctl, etc. One I particularly like is the shortcut for the Brush tool. It’s ‘B’. Just ‘B’! How easy is that to remember?! Thank you for the great ideas! I am inspired! Thanks for the comment! Good for you for putting your PS time first. 🙂 That’s something I don’t get to do yet, but it gets a little easier each day as my littlest one gets bigger & more independent. 🙂 SOMEDAY, when they’re all in school, I’m looking forward to having time to just sit and scrap, though I’m sure (like you’ve found with retirement), there will always be something else I’ll need to do. Such is life! Yes, shortcuts are AMAZING. I have to admit, I don’t use brushes often. I know designers often include brushes in their kits, but I actually prefer to use the .png files associated with the brushes (when included) so I can see what I have to work with without actually loading the brush and viewing it… Do you have a shortcut that you use to keep track of what each brush includes? I’d love to hear!